Solution: A common form of elemental phosphorus is the tetrahedral P4 molecule, where all four phosphorus atoms are equivalent: . 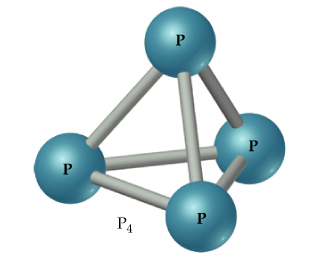 At room temperature phosphorus is a solid.Draw a Lewis structure for a linear P4 molecule that satisfies the octet rule. Draw a Lewis structure for a linear P4 molecule that satisfies the octet rule.